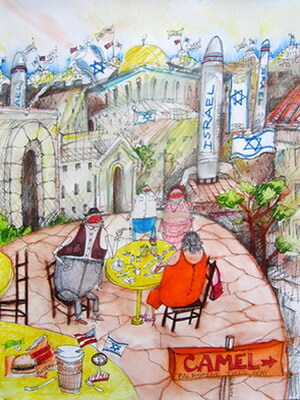 Suzanne Klotz is the creator of Thy Kingdom Come: Pocket Guide to the Holy Land, a vividly coloured book of captioned drawings that portray Israeli-occupied Palestine as she saw it between 1990 and 1995. To describe this work is in a sense to add a fourth lens to the view of the Israeli occupation and the associated war crimes being committed to perpetuate it, because the book is the artist’s vision of images seen through the naive eyes of an imaginary American tourist woman and her little daughter who arrive in the “Holy Land” excited to explore it. Therefore it is (1) fact (amply documented by the captions) filtered through (2) “innocent” observers’ perception, (3) illustrated by the artist. Yet, for all the distillation, the images in the guide pack a staggering punch. Perhaps to define the guide it is best to start with what it is not. It is not a comic book in the traditional form of a segmented epical narrative. Each page can be torn from the book to stand on its own like a fractal containing the features of the whole, spelling “Occupation.” What the American woman and her daughter see is shown in a series of pictorial snapshots, each of which contradicts the sanitized and sloganized concept of the “Holy Land” — “a land without people for a people without land” — a Zionist lie pervasively promoted in the American mass media. It is not an allegorical comic book in the manner of Spiegelman’s Maus, in which the predatory cats represent the Germans, the ruthless, greedy pigs stand for the Polish people and the defenceless mice for the Jews. Klotz’s guide does not indict any ethnic or religious group as a whole, but it forcefully and clearly blames an ideology: Zionism, which breeds, in a state arrogantly self-proclaimed as a “Light Unto Nations,” a culture of hatred. Legislated hatred and racism are epitomized by Israeli top leaders calling the Palestinians cockroaches, and by current leaders calling for their expulsion, a “final solution” to their desired aim of making Israel a state “for Jews only.” The artist sees Zionism as a misrepresentation of Judaic values. The guide is not, although it has that effect, a sarcastic travel brochure depicting highlights of the Zionist military occupation of Palestine any more than The Inferno is Dante’s tourist guide for Hell, although it would help a first-time visitor to cut through the miasma of propaganda down to the truth of Israel’s apartheid, occupation and war crimes. Finally, despite the numerous captions encapsulating data and facts of Israel’s systematic and ongoing land grab, ethnic cleansing and brutal oppression of the Palestinians as well as verifiable facts and figures related to the unlimited and unconditional American support (financial, military and diplomatic) of Israel, the book is not an illustrated pamphlet. Word and image are fused, whether the words are external captions or graffiti integrated within the image, into a visual whole. Nevertheless, Klotz herself considers the images simply as illustrations of what she saw with her own eyes over several years of close observation of life in occupied (and/or under siege) Palestine. In a sense the artist herself was at one time as an American visiting Israel for the first time. As a guest artist in residence at Mishkenot Shaananim — a non-governmental, non-political, international multicultural centre in Jerusalem — she first saw the realities on the ground in 1990. She returned many times for extended stays over the next five years, creating art programs, often in collaboration with Palestinian artists, and became familiar with the horror of Palestinian life under Israeli occupation only a street away (“just across Jaffa Street”), yet a world away from the relaxed and comfortable surroundings of Israeli life. She observed the moral compromise of many Israelis who had internalized the dichotomy of privately disagreeing with the government policies infringing on the Palestinians’ basic human rights without publicly opposing them. An advocate of human rights long before her Jerusalem epiphany, Klotz had spent time in Australia, deeply touched by the plight of the Australian aborigines. Ironically, when she left Australia to go to Israel for the first time, many of the aboriginal artists asked her for a great favour. Forcefully alienated from their ancestral culture, the Christianized Aborigines with no hope for redress in this life cling to the hope of help from their masters’ gods. They asked her to stick their written prayer in the Wailing Wall when she got to Jerusalem, which of course she did. Long after this memorable incident Klotz created a Portable Prayer Wall (marked Guaranteed and Made in the USA). As a way of making prayer intercession available to all, wherever they are, including those unable to reach the city now being cleansed, the Portable Prayer Wall has about it the inventive practicality as well as the wry irony of something that Mark Twain (one of the earliest anti-colonialism voices in America) might have come up with. Suzanne Klotz has an impressive body of work dedicated to the Palestinian tragedy and the destruction of Palestinian society and culture. The reason why Thy Kingdom Come deserves more space is not only because it is highly comprehensive and representative of her vision and talent, but also because she has been unable to publish it in the US. A digital documentary introduction to it, called The Other Side of the Holy Land, which she created in a college workshop, was attacked in the local press in her city (Sedona, Arizona) by the leadership of the City Arts and Culture Commission and described as anti-Semitic in a front-page article in the local paper. Equivalent to a persona non grata branding, this type of accusation creates an atmosphere in which an artist sees previous commitments reneged on by galleries and exhibit organizers, fails to find a willing publisher, and finds it increasingly harder to show and sell ones work. This is not surprising: after all, Americans now live in the time of the Patriot Act, and Israel’s perceived enemies are America’s enemies. Her commitment to the Palestinian cause is above all else spiritual. A deeply compassionate and genuine humanist, Klotz believes that the spiritual teachings of all major religions are the same. She also believes that Zionism has not only perverted and misrepresented Judaism to both Jews and Christians but is also misrepresenting and demonizing Muslims and Islam to the world. 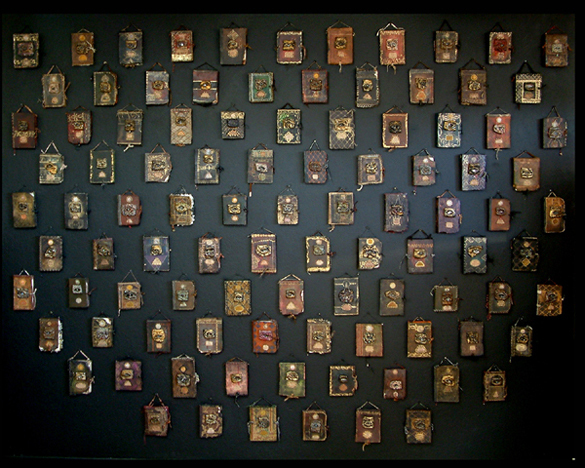 Her current work is a collection of 99 books she is creating, each representing one of God’s attributes. As she is working on them, she says that each day she selects one attribute to meditate on to achieve a deeper understanding of the virtue and apply it during the day. One of her dreams is one day to be able to create an art salon in southern Lebanon where she could meet with women to create artworks that incorporate traditional techniques, crafts and calligraphy. The salon would ensure the preservation of traditional arts and culture and the art would further the understanding that whether one says Allah, God, or Dios, the meaning is the same. Our moral obligation is to all people, because we are children of the same God. Until then, underemployed and over censored, she continues to work with imagination, talent and an apparently inexhaustible reservoir of compassion, endurance and hope. 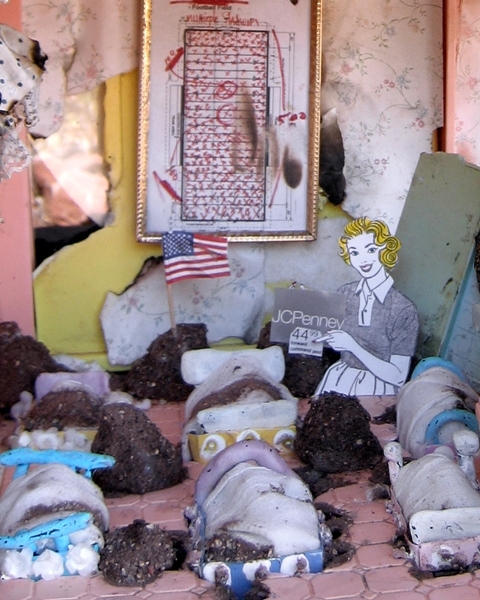 A telling example of her vision, talent and resourcefulness was seeing a house under demolition in her hometown one day and realizing that it would make the perfect medium for her installation — a life-size depiction of a destroyed Palestinian home (or for that matter, Lebanese or Iraqi). Judging by the photographs, the installation, especially given the mountainous landscape of Sedona, so similar to many places in hilly Palestine, was eerily evocative and strongly moving. You can’t make up anything anymore. The world itself is a satire. All you’re doing is recording it. – Art Buchwald, American political satirist and Washington Post columnist (1925–2007). The importance of humor within culture as a tool for disarming, for learning, and for opening up possibilities for willing and constructive interactions, is summed up in an early statement by the philosopher Plato: “Serious things cannot be understood without laughable things.”1 In our contemporary society, the role visual art performs within culture has been limited too often to its entertainment and aesthetic functions only. But the more challenging roles of art within culture are its civic, social and educational functions. Culture shapes the way we view the world. In a country that protects freedom of speech yet lives with daily censorship for fear of terrorism, whose primary ethos has become unmindful consumption, these vital purposes for art making and viewing are too frequently forgotten, misunderstood, undervalued, or viewed with utter suspicion. 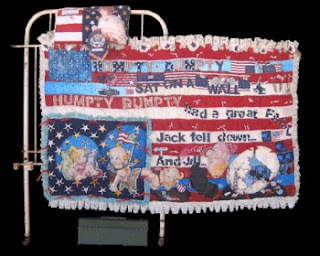 Art that uses visual humor can thus function like a sugarcoated pill, giving viewers greater incentive to pay attention to and understand more deeply the serious things, while laughing at the comedy of errors that is the human condition. Suzanne Klotz’s socially relevant mixed media works seduce viewers with their lush surface rendering, deft puns and symbolic use of materials, yet overwhelm with their carefully researched facts and figures. Banal objects from pop culture, military culture and daily use are transformed by a keen sense of social irony to complicate their consumer-driven surface illusions and more readily locate the less visible truths lying beneath their luscious façades. These thought-provoking images reveal a vivid commentary on the events of our times, conjure a haunting vision of a world without reason, and remind us that an understanding of the past is crucial to our present and future. Her works prompt us to reexamine our values, social behaviors and morals and they reflect, in an ironic way, the misconceptions many Americans have about America’s role in global society. They demonstrate a way to continue being critical, forceful and penetrating without hatred and without marked disrespect for the religious convictions of diverse believers and non-believers alike. The exhibition seeks to create awareness and dialogue about human rights abuses, examine the impact of military invasion and occupation, and explore relationships between social and personal accountability and power. Beneath the interconnected themes is a passionate commitment to human rights and an outrage against hypocrisy and injustice. 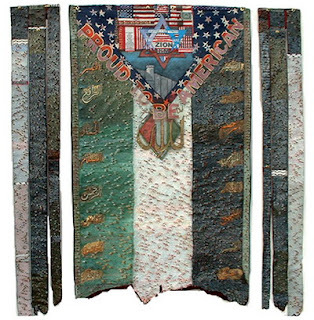 In Unclaimed Laundry (2007), an inverted American flag (symbol of distress and a metaphor for an inverted democracy), a shredded Palestinian flag, and embroidered and découpaged hand towels, handkerchief, and pillowcases are physically suspended from a vintage Cordomatic clothesline–implying they’ve been left to dangle from a naïve 1950s ethos of America’s place in the global order. Pink parrots flitter and alight in a Disney-esque parody of American suburban domestic order. Here she uses the images of one reality to describe, by implied comparison, another reality, asking in the process: if we define ourselves according to a marketing myth, what kind of worldview has it given us? On closer inspection, the pillowcases on which we rest our heads and the towels upon which we wipe our hands image only chaos and the atrocities of war in the Middle East. Each panel on the clothesline addresses specific violations of the Universal Declaration of Human Rights. The domestic iconography of “God Bless Our Home” and “God Bless Mommy and Daddy Forever,” sayings common to the American heartland, are here bitingly inverted and complicated by facts and figures that detail the number of Palestinian homes destroyed in the heavily disputed 2002 “massacre” in the West Bank refugee camp of Jenin during Operation Defensive Shield in the Second Intifada using Israeli state-modified military versions of the U.S. Caterpillar D9 armored bulldozers. Listed also are numbers of Palestinian males and children imprisoned without specific charges or trials. As a meditation on expanding meanings of “home,” it is clear in this satire of domestic family values that these same values are literally “hung out to dry” when applied to military aggression in other homelands. American dollar bills are tucked under the clothespins, presumably to reference the amount of unwavering diplomatic and material support the United States provides the Israeli state and the related effort to spread ‘democracy’ throughout the region. A small kerchief appropriates Disney characters to transpose Mickey Mouse into a police officer holding a hoop for Pluto to jump through while informing us that over 1,500 laws regulate daily activity in Palestine, like so many loopholes to jump through, “catch-22’s” to avoid and checkpoints that must be navigated daily. Knowing that American audiences have become numb and desensitized to the banality of human body counts, Klotz includes information regarding the bombing of a Gaza Petting Zoo, including an image of an ostrich with a leg blown off and a very angry teddy bear pondering the list and numbers of remaining victims. Poignantly, those two pink parrots that Americans so love to display on the outer walls of their suburban homes have a double reading as escapees from that same bombed out Gaza petting zoo. 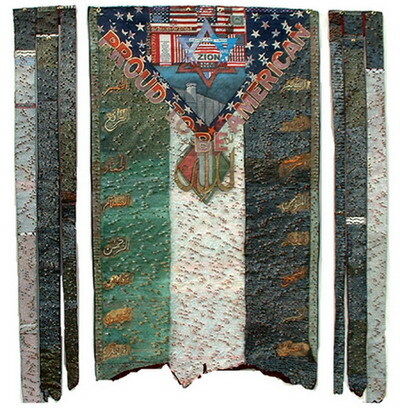 In Clean Sweep Settlement Extruder (2007), an Electrolux vacuum cleaner refitted with mounds of concrete, rocks, bullet shells, gas mask and Israeli and U.S. flags, suctions a Palestinian flag through one hose while an “extruder” hose drops mounds of concrete representing new settlements. 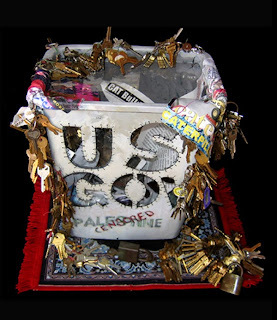 Cast iron praying hands atop the machine allude to nationalist objectives that masquerade in the guise of religion (the artist is careful in her work to separate Judaic religious beliefs from Zionist political aspirations). The satire is distilled, compact and clear: a familiar household item is used to personalize the impact of the machinery of state that forces people out of their territory. Each of her works becomes a powerful indictment of man’s inhumanity to man. By contrast, there is nothing satirical in her treatment of authentic faith. 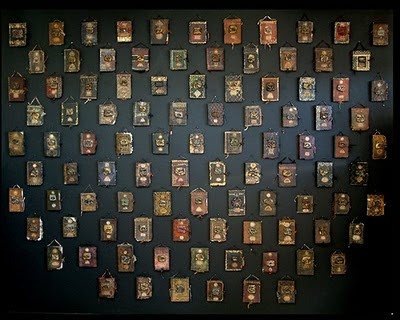 99 Names (2007) is a series of ninety-nine handcrafted books, each referencing a separate attribute, or virtue, of God as recorded in the Qur’an. The books affirm the unity within the spiritual teachings of the major world religions and double as personal interactive journals for recording one’s private application of each virtue. 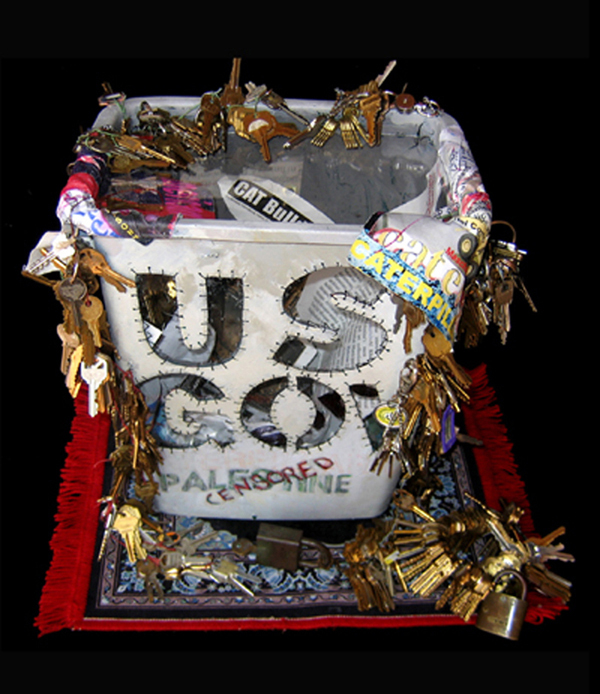 Democracy Sampler (Cookies from the White House) (2006), consists of a U.S. Army-issued ammunition box, filled with ceramic stoneware “cookies” packaged in separate biohazard specimen bags. Each cookie represents a different chemical used in warfare in Iraq , it’s name printed on one of those little American toothpick flags like some demented American Diner home-cooked meal. The chemicals include: Nerve Gas, White Phosphorous, Depleted Uranium, Cluster Bombs, Napalm, and 70 tons of radiation poisoning. Facts and figures served up with such scathing parody are sobering, their impact palpable. By addressing a wide array of issues, Klotz suggests such follies are not limited to the Middle East but common in every civil society. Her warning cautions that even to the victor will come ruin. Witty, grotesque and satirical, her intent is to create visual experiences that challenge aesthetic and intellectual complacency and expand social consciousness and awareness. In navigating the terrain between indifference and attentiveness, conditioning and compassion, Klotz reminds us that art provides humanity with a compass, and that hers can function as a willing moral guide. Too often, we tend to view artworks as final answers, when in fact most artists see their works as questions posed. In Family Ties, the questions are laser precise in their spiritual and ethical dimensions: How can our individual fears override our common humanity? How can unjust treatment of other human beings ever be justified? How do humans settle in their conscience questionable actions taken by governments elected to represent them? What do our tax dollars fund overseas? How do our noblest ideals fare around the world? Where is our collective voice of outrage? The exhibit provokes viewers into asking themselves internal questions for which there are no easy answers. Thus, these satiric works can run the risk of provoking viewers to an anger directed at the art or the artist for providing the stimulus. The more difficult step is for viewers to interact constructively by asking themselves where they stand personally and what might they do. We are asked to connect our own core humanity to that of these other cultures for whom American export culture and political decision-making translate into real daily impact. Viewing these works, we may laugh uproariously one minute, only to become embarrassed by our response the next, or find the humor uplifting, or very nasty. Because satire combines outrage and humor it can be profoundly disturbing. Satire is thus a form of stealthy criticism. An art of civic engagement needs to disturb our deep indifference and complacency, not in order to make us feel bad about ourselves, but precisely in order to think more deeply, feel more sharply, what American ideals, rights, privileges and our roles as American citizens mean, not in simplistic, conditioned ways, but under difficult conditions. If you don’t laugh, you miss the point. If you only laugh, you miss your chance for deeper meaning and illumination. Klotz’s satire reminds us it’s not ok to escape from everything else all of the time, and brings a sober awareness that the world can’t fade into the background forever. Often she makes her point by pushing the satire over the top where we no longer laugh, provoking viewers into extreme cognitive discomfort. In those moments the cynical overtone evidences the artist knows it’s futile to think she might correctively restore paradise to earth through her artworks. At best she is aware that, although she may hope to reform and restore through her works, she can guarantee only to expose vice and hypocrisy, to make them sufficiently repulsive through the shock of recognition, to simply slow the course of greater evil. What happens when we can no longer laugh while viewing her work? When we feel so traumatized we don’t know whether to laugh or cry? We begin to think, to become attentive, possibly to anger, and possibly to desire an alternative outcome than that represented in her imagery. Suzanne Klotz’s work draws from personal experience – she has witnessed the effects of military aggression on the families of both Palestinians and Israelis. Between 1990 and 1995, she was a repeated guest artist of Mishkenot Sha’ananim, a non-governmental International Cultural Centre in Jerusalem. Much of her time was spent in the West Bank and Israel, facilitating collaborative exchanges between Palestinian and Israeli artists, educators, and professionals, culminating in a landmark group exhibit at the Municipal Gallery in Jerusalem. She has been an eyewitness to events in the region only to see them misrepresented in the American media, and thus feels strongly that it is important for people to personally investigate truth in distant lands as well as in their own back yards. Her use of familiar household materials deliberately personalizes some of the ‘unseen’ aspects of war and questions the effects of military occupation not only on the forces involved but also on the family dynamics of society at large. The book publication and exhibition title, Family Ties Occupied Art, implies that the foundation of a society is in the strength of its family bonds, which comprise the strength of the community, and by extension, the strength of a nation is dependent on its ability to interact with other nations. The larger implications regard the greater human family to which we all belong, and thus we are all implicated here. From the nursery rhymes we sing as children, to the Proud To Be American t-shirts and hats we wear, to the foreign-made products we buy, the taxes we pay and the gas burned on family trips–we are all in this together for better or for worse!